…and had a different matching wine with each type. We had a great evening! Home-made ravioli tastes so much better than the stuff from a factory you can buy at the supermarket. 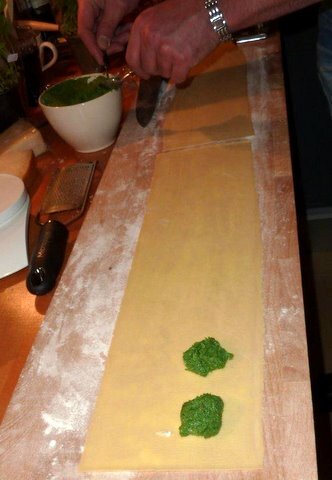 It will take a bit of practice, but if you already know how to make fresh pasta it’s not very hard if you follow my instructions for making home-made fresh pasta. 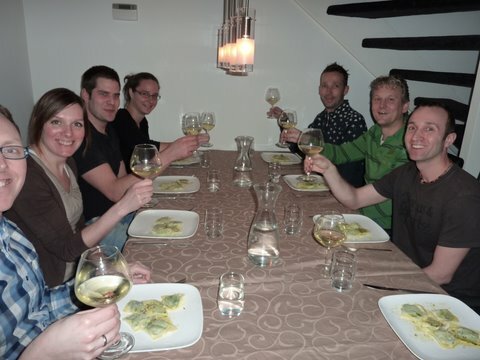 With a group of 8 we had a full meal out of the 5 ravioli courses, using 8 eggs and 800 grams of Italian 00 flour. Below are the recipes for the stuffings. Unfortunately we did not take pictures of all the steps or all the finished dishes, but as you will see most preparations are very similar. Cook 400 grams (0.88 lb) of fresh spinach (with just the water attached to the leaves after washing) for 5 minutes, turning halfway for even cooking. Drain spinach and let it cool a bit. Use an old kitchen towel to squeeze the moisture out of the spinach. In a food processor mix the spinach with 250 grams (9 oz) ricotta, 1 egg, 4 tbsp fresly grated parmigiano reggiano, freshly grated nutmeg, salt and freshly ground black pepper. Process until smooth. Taste to add more parmigiano, nutmeg, salt or pepper. Take into account that the stuffing should be tasting a bit stronger/more salty than you’d like the final dish to taste. Keep the stuffing in the refrigerator for at least an hour, covered with plastic wrap, to let it firm a bit. Make the ravioli and cook them for a few minutes in salted boiling water. Serve the ravioli with melted butter in which you have gently sautéed some chopped sage and sprinkle with fresly grated parmigiano. Wine pairing: we had it with a Verdicchio dei Castelli di Jesi. Many dry Italian whites will work with this. 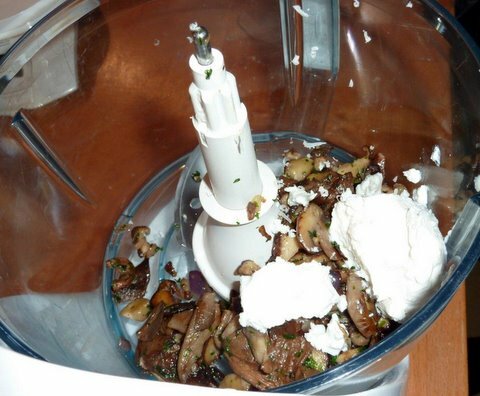 In a food processor mix remaining mushrooms with 120 grams (4 oz) ricotta, 4 tbsp freshly grated parmigiano reggiano. Process until you obtain a course mixture. 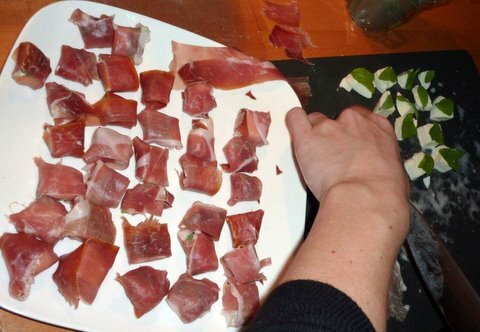 Taste to add more parmiginao, salt or pepper. Take into account that the stuffing should be tasting a bit stronger/more salty than you’d like the final dish to taste. Filter the reserved porcini soaking liquid using paper towels. 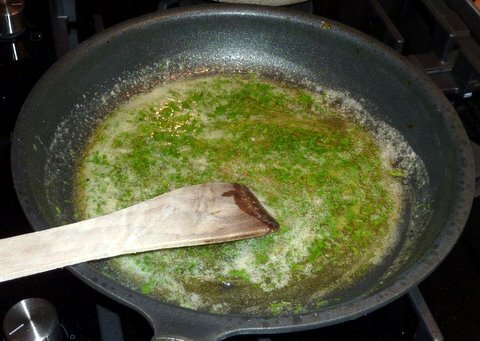 Simmer to reduce the liquid to around 1/4. Reheat the reserved mushrooms in some butter. 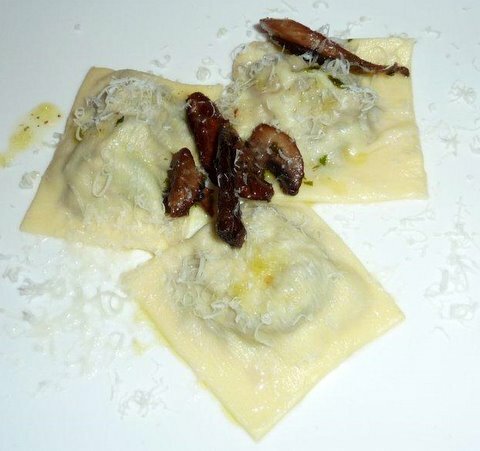 Serve the ravioli with the reserved mushrooms, the porcini liquid and sprinkle with freshly grated parmigiano. Wine pairing: we had this with Malvirà Arneis Trinità 2009. Many dry Italian whites will work with this. In a food processor mix 120 grams (4 oz) of ricotta with 120 grams (4 oz) of soft raw-milk French goat cheese such as crottin de chavignol, an egg and 4 tbsp freshly grated parmigiano reggiano. Taste to add more parmigiano, salt or pepper. Take into account that the stuffing should be tasting a bit stronger/more salty than you’d like the final dish to taste. 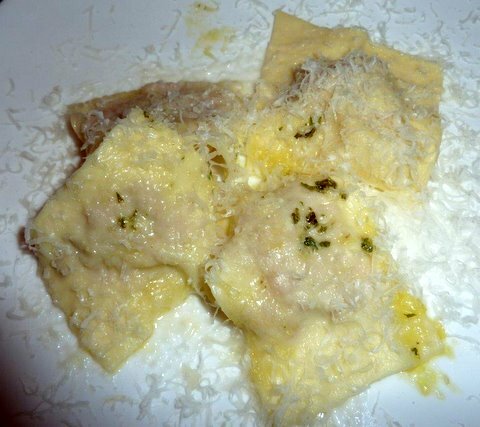 Serve the ravioli with melted butter and sprinkle with fresly grated parmigiano. Garnish with asparagus (white steamed asparagus or green roasted asparagus). Wine pairing: definitely sauvignon blanc, outstanding with Sancerre or Pouilly-Fumé. Wine pairing: full-bodied Italian dry white, such as a Verdicchio dei Castelli di Jesi Classico Superiore (rather than the lighter verdicchio with the spinach-ricotta). We had the Bucci Classico 2009, which was outstanding with this dish. Dice 100 grams (4 oz) of tender veal, boneless and skinless chicken thigh or pork tenderloin and sauté in butter until golden. Add 4 tbsp freshly grated parmigiano reggiano and freshly grated nutmeg. Process until homogenous but not pureed. Wine pairing: we had it with a very nice Barbera d’Alba. A full-bodied Italian white or another light Italian red would also work. Hi Stephan – thank you so much for your pasta postings! I read your fresh pasta tutorial and, along with other input, made a test batch of pasta earlier in the week (using a new pasta machine – cheap and cheerful £20 from Lakeland in the UK) with 100g of plain (all purpose) flour and a large egg. Not meant for a meal,l but cut up a tester serving into tagliatelle and served with olive oil, parmesan, salt and pepper and got happy responses from the family. This evening, I followed your recipe and advice to make ravioli with spinach and ricotta. used 00 flour this time. I used 4 eggs (large UK) and just under 400g flour – followed your suggestion and used 90% flour in the initial mix in the food processor and then added more as I kneaded. The pasta was delicious. 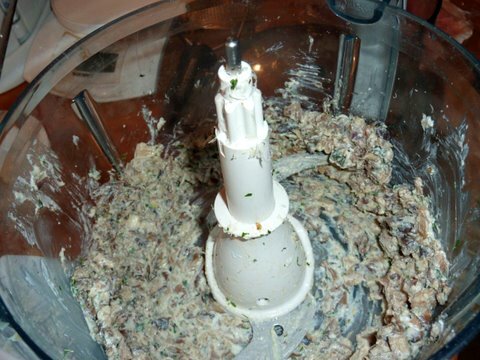 I also followed your recipe for spinach and ricotta filling – from your workshop recipe. I halved it as I was only cooking for 4 and thought this would give me enough filling for 24 ravioli. Ended up using only half of the past a dough and all of the filling and getting 17 ravioli. Not sure what went wrong there in terms of amounts….however, no burst ravioli which was my big concern and I think 4 each with some bread on the side was probably enough for all anyway. My husband, who would happily eat 17 ravioli himself, got the extra one. Anyway…all of it was delicious and happily eaten up immediately! I served with a tomato and mascarpone sauce…was planning the sage butter, but couldn’t find any fresh sage in shops here this weekend. I am very happy (actually smug) with my first attempt. Thanks for sharing your experience – it really helped. Sounds like your first attempt went very well indeed. Thanks so much for reporting back. Perhaps you put a lot of filling into the spinach and ricotta ravioli? Only a teaspoon of filling suffices, or even less (but then it’s more work as you will have to make more ravioli to use up the filling).